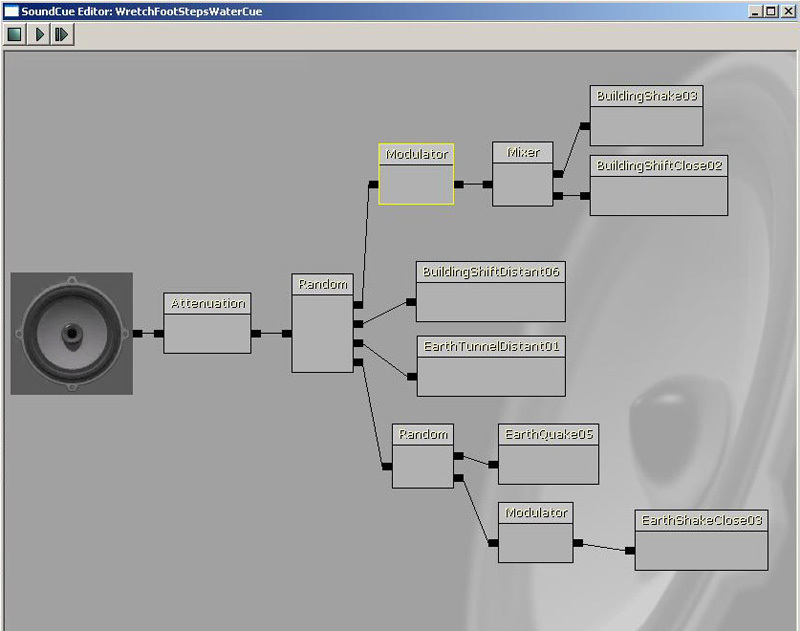 Unreal Engine 3 provides various SoundCue nodes built-in that can be used to create interesting and complex sounds. Attenuate - If true, the node will fade the input sound out over distance. Spatialize - If true, the node will position the input sound in 3D space. dB Attenuation At Max - Sets the volume at the max distance in deciBels. Distance Algorithm - Sets the interpolation method to use when attenuating the input sound. ATTENUATION_Linear - Attenutes the input sound linearly over distance. ATTENUATION_Logarithmic - Attenuates the input sound logarithmically over distance. ATTENUATION_Inverse - Attenuates the input sound using an inverse function over distance. ATTENUATION_LogReverse - Attenuates the input sound using a reverse logarithmic function over distance. ATTENUATION_NaturalSound - Attenuates the input sound using a special function that approximates the way sound naturally attenuates over distance. Distance Type - Sets the special attenuation mode to use. SOUNDDISTANCE_Normal - Normal attenuation over distance in all axes. SOUNDDISTANCE_InfiniteXYPlane - Only attenuate the input sound using the distance in the Z-axis. SOUNDDISTANCE_InfiniteXZPlane - Only attenuate the input sound using the distance in the Y-axis. SOUNDDISTANCE_InfiniteYZPlane - Only attenuate the input sound using the distance in the X-axis. Radius Min - Distance from the sound's origin where attenuation should begin to occur. The input sound plays at 100% volume between 0.0 and this distance. Radius Max - Distance from the sound's origin where attenuation should be completed. The input sound fades from 100% to 0% between Radius Min and this distance. Attenuate With LPF - If true, attenuation via low pass filter is enabled. LPFRadius Min - Sets the distance from the sound's origin where the low pass filter should begin to be applied. LPFRadius Max - Sets the distance from the sound's origin where the maximum amount of low pass filter should be applied. Stereo files play evenly on the Left and Right channels and attenuate allowing volume fades between the Radius min and Radius Max values, but they are not spatialized. Cues that do not contain the Attenuation Node are not localized and play consistently at the Cue volume setting. For more information on the available types of Attenuation curves, see the documentation at DistanceModel Attenuation Curves. The Concatenator Node is used to concatenate, or splice, two or more separate sounds into one. Each input sound is added to the end of the previous one forming one continuous sound. By default, there are two inputs on this node, but more inputs can be added by right-clicking on the Concatenator Node and choosing Add Input. Sound Nodes may be connected directly to the Concatenator Node inputs but you can also add nodes between them for independent control per layer. Input Volume - List of volumes to use for each of the input sounds allowing normalization for sounds with different source volumes. The Delay Node simply inserts a delay into the audio node chain to cause a pause before the input sound is passed to the output. The amount of the delay is a random value between the min and max specified in the proeprties. Delay [Min/Max] - Sets the [minimum/maximum] amount of time the Delay Node should pause for. The Distance CrossFade Node provides the ability to fade between two or more input sounds based on the distance from the sound cue's origin. By default, there are two inputs on this node, but more inputs can be added by right-clicking on the Distance CrossFade Node and choosing Add Input. Sound Nodes may be connected directly to the Distance CrossFade Node inputs but you can also add nodes between them for independent control per layer. Fade In Distance [Start/End] - Sets the distance from the sound cue's origin to [begin/complete] fading in to this input sound. Fade Out Distance [Start/End] - Sets the distance from the sound cue's origin to [begin/complete] fading out from this input sound. Volume - Sets the volume of this sound when completely faded in. The Looping Node is used to set a Sound Node Wave to looping. The adjustable parameter Loop Count Max and Loop Count Min default high to provide virtually endless playback but it can also be set to a specific number of loops if desired. The actual number of times will be a random value between the two property values. You can loop multiple audio files independently when used in conjunction with the Mixer Node. Loop Indefinitely - If true, the input sound will loop indefinitel regardless of the values of Loop Count Min and Loop Count Max. Loop Count [Min/Max] - Sets the [minimum/maximum] number of times the input sound should loop. The Mixer Node is used to trigger multiple Sound Node Waves simultaneously. Inputs are added for each audio file by right clicking on the Mixer Node and selecting Add Input. Sound Nodes may be connected directly to the Mixer Node inputs but you can also add nodes between them for independent control per layer. The Modulator Node is used to add random Volume and Pitch modulation. Each has a Max and Min value to determine the range of randomization, when the Cue is triggered it randomly selects a value within that range. You can use the Modulator Node to adjust Volume + Pitch consistently by setting the Min and Max to the same values. It can also be used to adjust relative volumes of multiple Sound Node Waves contained within a Cue. If the Modulator Node is used in conjunction with the Looping Node it'll randomly select upon Cue retrigger not per loop revolution. Pitch [Min/Max] - Sets the [minimum/maximum] pitch for the input sound. Volume [Min/Max] - Sets the [minimum/maximum] volume for the input sound. The Continuous Modulator Node allows game play parameters to control volume and pitch modulation in real time. A typical example is using the velocity of a vehicle to correspond to the pitch of an engine sound. This modulator needs to be hooked up in code for desired purposes and doesn't function stand alone within the SoundCue Editor. [Pitch/Volume] Modulation - Distribution for controlling the [pitch/volume] of the input sound. Defaults to a Uniform distribution, but can be changed in the editor to any other type. The Oscillator Node is used to add continuous pitch and volume oscillation over time. This is mostly useful on looping sounds to create a greater degree of ongoing movement. Modulate [Volume/Pitch] - If true, [volume/pitch] modulation is enabled. Amplitude [Min/Max] - Amplitude of the sine wave's modulation, centered around the value 1. For example, an Amplitude of .25 would modulate between the values .75 and 1.25 [Min/Max] fields are provided for randomization. Frequency [Min/Max] - Frequency of the sine wave's modulation, with the value divided by two to equal to the hertz rate. For example, a Frequency of 20 would oscillate at 10 hz (times per second). [Min/Max] fields are provided for randomization. Offset [Min/Max] - Offset value into the sine wave; commonly called phase. Any value here will be multiplied by 2*Pi. [Min/Max] fields are provided for randomization. Center [Min/Max] - A center of .5 would oscillate around .5 [Min/Max] fields are provided for randomization. 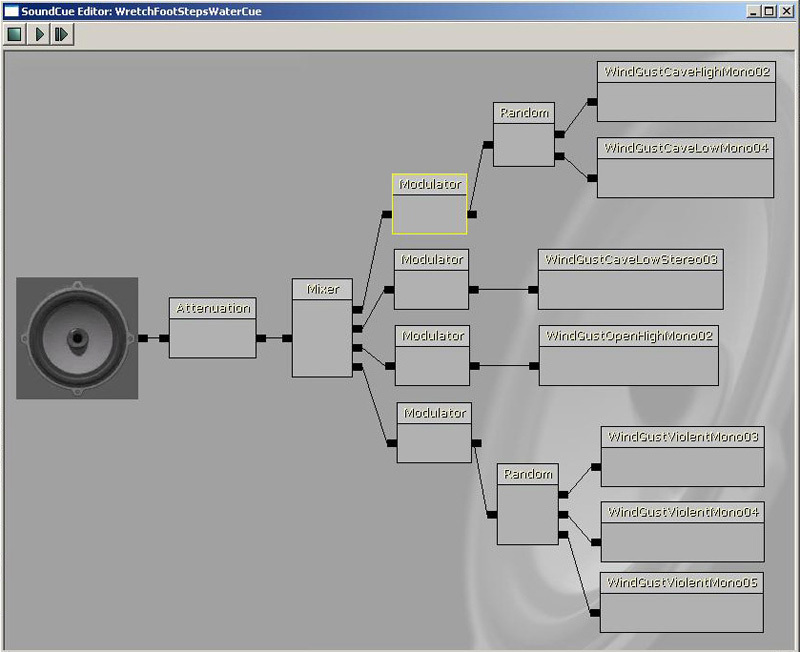 The Random Node is used to randomly trigger a Sound Node Wave from within a group of possible Sound Node Waves. Weight controls the probability a Sound Node Wave will be triggered relative to other Sound Node Waves in the Actor. The check box RandomWithoutReplacement will exhaust the entire list of possible Sound Nodes before repetition. 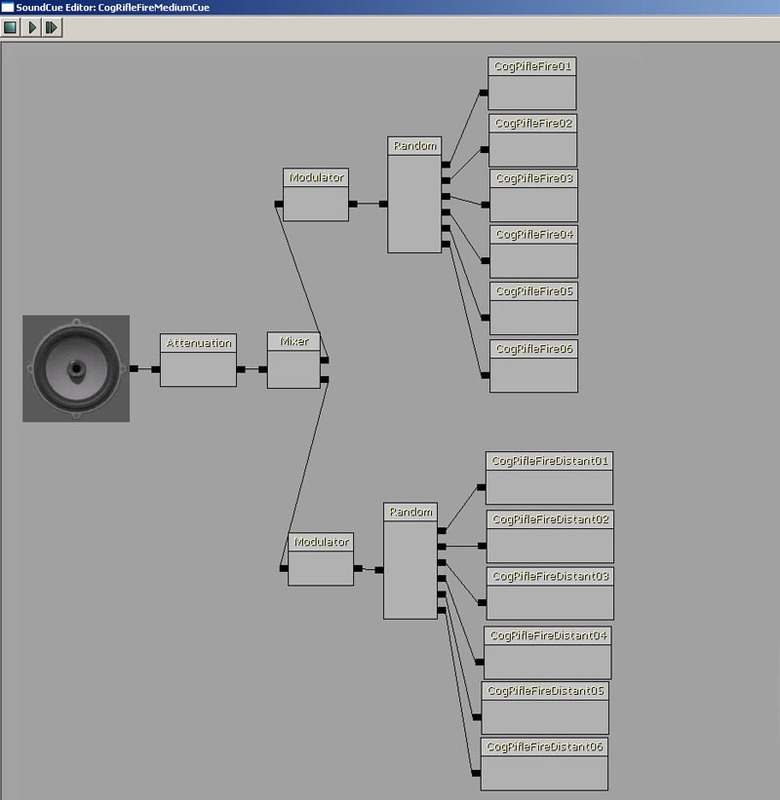 Inputs are added for each audio file by right clicking on the Random Node and selecting Add Input. Sound Node Waves may be connected directly to the Random Node but you can also add nodes between them for additional control. Weights - List of weights for each input sound determining the odds that a particular sound will be chosen. Randomize Without Replacement - If true, once a sound is chosen it will not be able to be played again until all input sounds have been played. This plays four audio files simultaneously upon trigger with random variation upon retrigger. This plays one audio file upon trigger with random variations upon retrigger.